The Carl Vinson Institute of Government has served the USG in different capacities for many years. My first-hand knowledge came from a CVIOG-sponsored outreach trip to China. We explored culture and educational opportunities throughout our visit with the partnership campuses that CVIOG had developed over many years. On my ten day trip to China, the coordination, precision planning, educational experience, and cultural enrichment that our group enjoyed was top notch. All of the wonderful characteristics of our trip were because of the CVIOG team and their pre-planning and execution. A trip of that length and magnitude in a foreign country is hard to pull off, and the CVIOG made it appear seamless. The reputation of the CVIOG that has been built around the great work they have conducted over the years with governmental leaders in Georgia, nationally and internationally is truly an asset for the State of Georgia. Congratulations on your anniversary! Most of my career has been spent in the private sector as a geospatial consultant. CVIOG leadership and staff have been considered a partner in many instances where my work was primarily focused on serving various local government entities (cities/counties) in Georgia by providing those entities with aerial mapping data and other geospatial services. Eric McRae [of the CVIOG] has long served as a subject matter expert and leader in the geospatial profession statewide. Eric's involvement has often resulted in the successful application of new technology to improve the efficiency of local government. Jimmy Nolan [also of the CVIOG] has served as a great resource with his extensive, statewide network and significant technical knowledge of all aspects of GIS/mapping and property assessment. 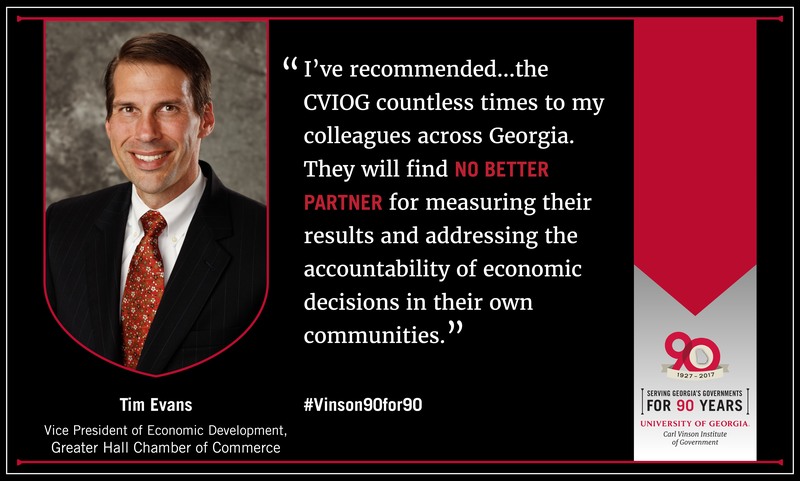 As a private sector consultant working directly with many of Georgia's local government entities, my experience has shown CVIOG has the ability to work in partnership with the private sector while keeping the best interest of state and local government in mind. CVIOG staff have also advocated for quality private sector consulting and served its constituents well by advising them effectively on the prudent use of technology. 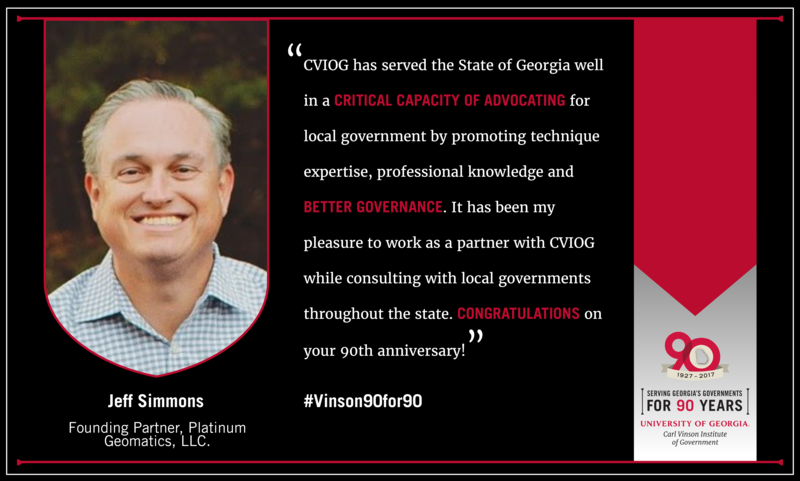 CVIOG has served the state of Georgia well in a critical capacity of advocating for local government by promoting technical expertise, professional knowledge and better governance. It has been my pleasure to work as a partner with CVIOG while consulting with local governments throughout the state. Congratulations on your 90th Anniversary! The State Charter Schools Commission (SCSC) staff has contracted with CVIOG to provide an array of services to state charter school governing boards, leaders, and staff members. CVIOG faculty and staff have presented at SCSC trainings, provided strategic planning services to boards, and our organizations have worked together to create a certification program to address the unique skillset required of those who manage charter school finances. 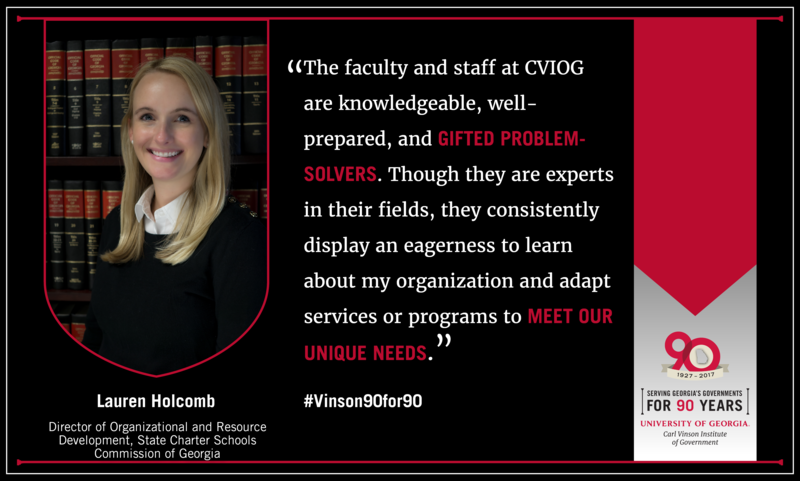 The faculty and staff at CVIOG are knowledgeable, well-prepared, and gifted problem-solvers. Though they are experts in their field, they consistently display an eagerness to learn about my organization and adapt services or programs to meet our unique needs. Through our work with CVIOG, state charter school governing board members, leaders, and staffs are better equipped to serve the students at their schools. The primary reason that charter schools close is due to financial mismanagement. Since implementing the financial management certification program with CVIOG, we have seen an overall improvement in the financial performance of state charter schools, as monitored through the SCSC Comprehensive Performance Framework. 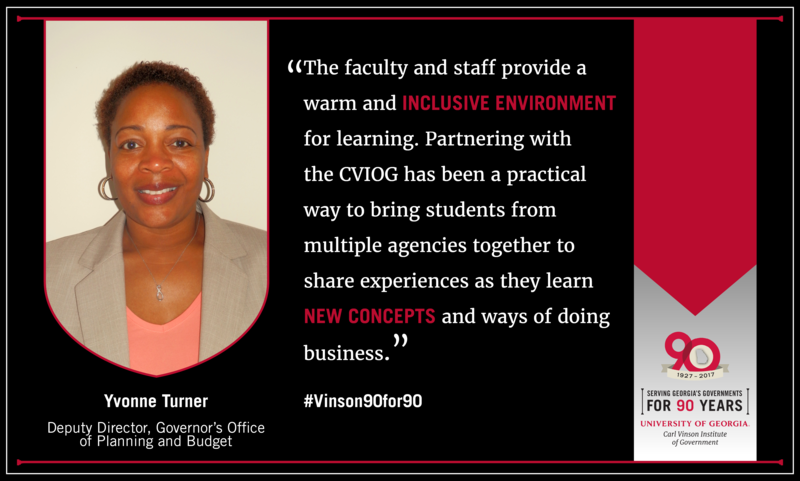 We greatly appreciate the ongoing partnership with CVIOG! 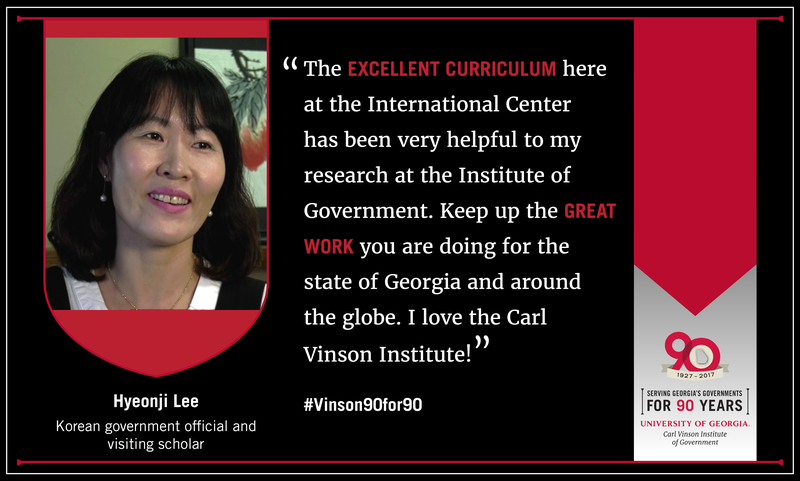 For many years Gwinnett County has partnered with the UGA Carl Vinson Institute of Government for training, education, and other local government services. These services include management and leadership training for elected officials and staff, local finance officer training, and strategic planning facilitation. Gwinnett County continues to utilize the services due to the high quality of the faculty and staff and their expertise in public service. The most recent example of our partnership and their customized service was the planning and facilitation of the Board of Commissioners Strategic Planning Session held in March 2017. The team from the Institute has already committed to the 2018 Strategic Planning Session. The Institute provides comprehensive training opportunities for local government services. The impact of this training results in a workforce which is more knowledgeable and skilled. 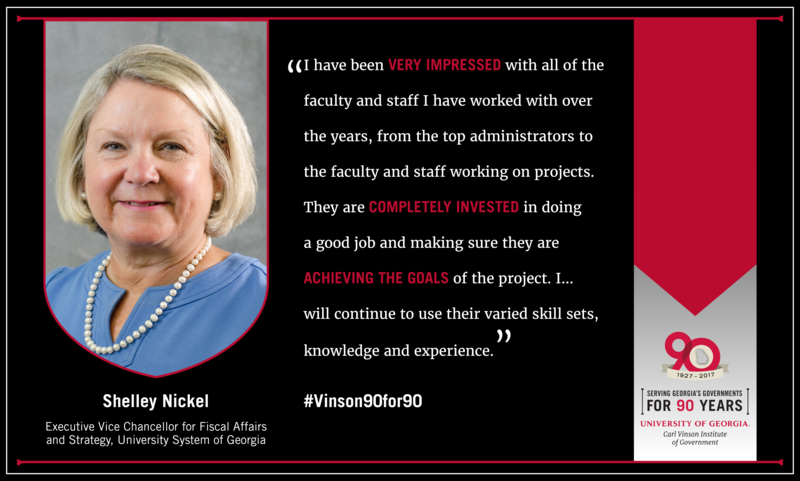 With the Vinson Institute's assistance, Gwinnett County launched our executive management program, EXCEL, in 2002. In addition, the Institute continues to play a significant role in our leadership training program. These programs will have a long-lasting positive effect on the delivery of services to our community. 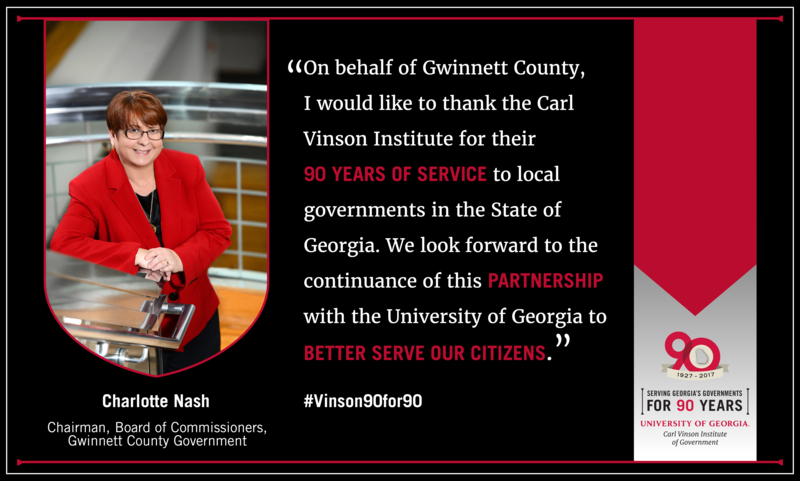 On behalf of Gwinnett County, I would like to thank the Carl Vinson Institute of Government for their 90 years of service to local governments in the state of Georgia. We look forward to the continuance of this partnership with the University of Georgia to better serve our citizens. In what ways or types of project work has the University of Georgia Carl Vinson Institute of Government served you and your agency? I have worked with the UGA Carl Vinson Institute of Government on several projects. These include two Economic Impact Studies along with other projects focused on stakeholder engagement and expanding DECAL's research capacity. I have found staff to be accessible, professional, and adaptable to client needs. I was especially impressed with the work that the Institute did around developing materials for our second Economic Impact Study. Staff produced materials from the study that have been well-received and have helped ensure that a broad audience is aware of the study and the findings. We are currently working with faculty and staff on a research grant and I am pleased with staff flexibility and adapting the project to best meet our needs. 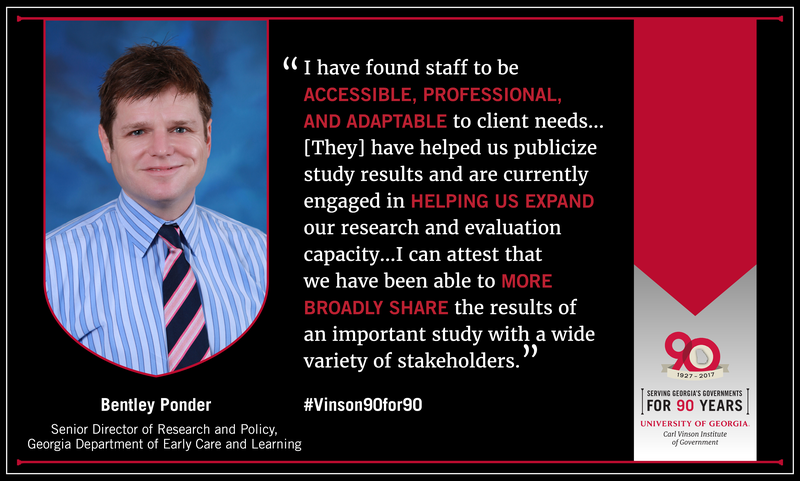 Institute staff have helped us publicize study results and are currently engaged in helping us expand our research and evaluation capacity. The impact of the work is hard to measure but I can attest that we have been able to more broadly share the results of an important study with a wide variety of stakeholders. I look forward to working with the Institute on future projects. I have been fortunate to work with the Institute in several capacities during my career. Most recently, the Institute has developed enrollment projections for all 28 USG institutions that are used for planning and budgeting purposes. They are very accurate and assist us in making data driven decisions. They have also developed several enrollment tools for the USG to help us manage recruitment and enrollment. These tools are most helpful to our smaller institutions who have little or no data analysis capabilities on campus. I have been very impressed with all of the faculty and staff I have worked with over the years, from the top administrators to the faculty and staff working on projects. They are completely invested in doing a good job and making sure they are achieving the goals of the project. Years ago, I worked with the Institute as a member of a legislative study committee studying possible changes to the HOPE Scholarship. The atmosphere was politically charged, but the Institute personnel handled it with professionalism and candor. It was a successfully managed so that the proposed changes were acceptable to both sides. I have had a very positive experience working with the Institute and will continue to use their varied skill sets, knowledge and experience in the future. CVIOG and our office worked to develop materials to train employees on various state government budgeting processes. The budget and finance analyst training has assisted our organization with developing the skills necessary to understand the laws, policies, and procedures specific to the State of Georgia. The faculty and staff provide a warm and inclusive environment for learning. The training is more than a PowerPoint presentation of facts. The team allows students to use examples from their respective organizations to help facilitate the learning. This method of teaching allows the students to use the material learned immediately. What type of impact has the work of the Institute made on your agency? What evidence can you share of positive change made as a result of the Institute's work? State government is constantly transforming. Partnering with CVIOG has been a practical way to bring students from multiple agencies together to share experiences as they learn new concepts and ways of doing business. Providing training from an enterprise perspective ensures that students learn information that would be helpful as they move across state government working in different agencies. 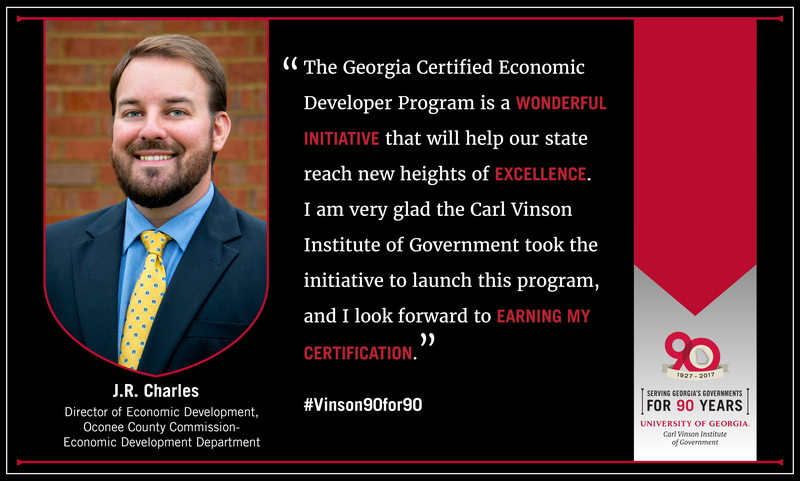 The Carl Vinson Institute has helped us evaluate the economic impact of major initiatives from job creation and investment projects affecting the Gainesville-Hall County MSA. The CVIOG has helped put a finer point on economic impact and put projects in perspective. Dr. Wes Clarke has been a part of our economic development team in recent years. He's contributed his knowledge of econometrics to help measure economic impact of jobs and investment in Hall County. He is a real professional and an outstanding resource for guidance. He has a gift for translating complex issues into relative and simple terms. Working together with the Carl Vinson Institute of Government has helped our business and elected leadership evaluate economic development projects that require a community investment. With that, we are better equipped to project the return on investment over time through direct and indirect economic impacts. Dr. Clarke and the Carl Vinson Institute of Government have answered a real need for local economic development organizations, business and elected officials to understand economic impact in a way that can be heard. I've recommended Dr. Clarke and the CVIOG countless times to my colleagues across Georgia. They will find no better partner for measuring their results and addressing the accountability of economic decisions in their own communities. 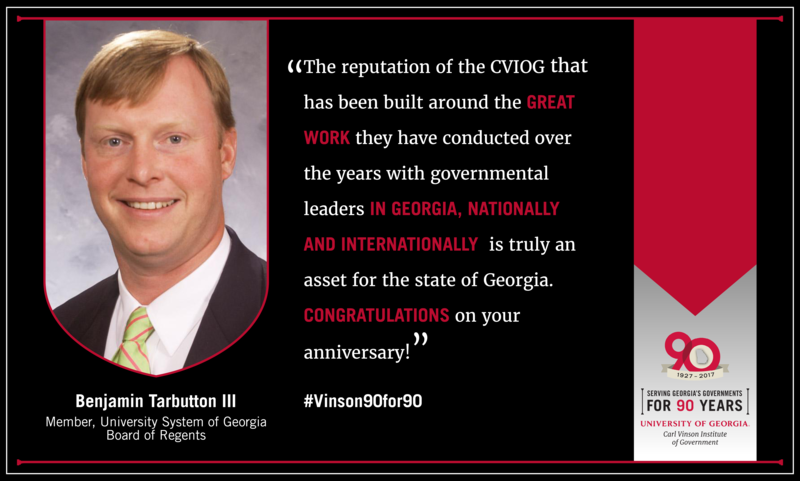 The Georgia Department of Labor and the UGA Carl Vinson Institute of Government have enjoyed a continuous, long-standing partnership of 25 years. 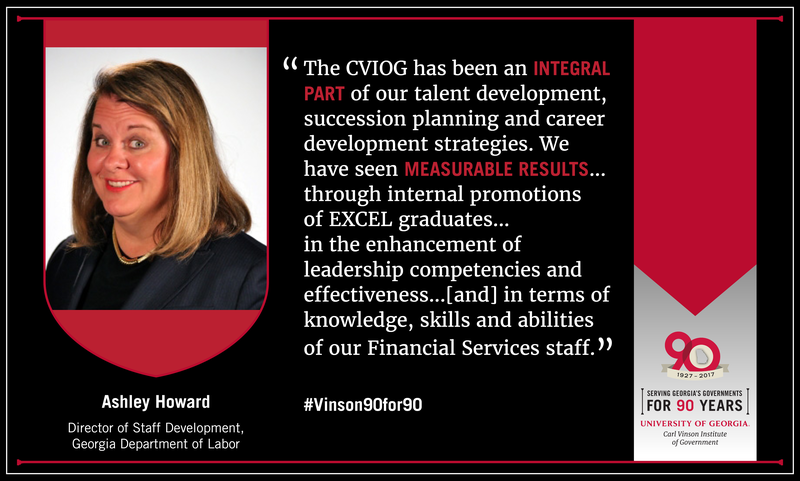 The CVIOG has been an integral part of our talent development, succession planning and career development strategies. Since 1992, the CVIOG and GDOL have partnered to co-administer the EXCEL (Executive Commitment to Excellence in Leadership) Academy. The Academy is an intensive year-long study of leadership competencies critical to managerial success in the workplace. The GDOL facilitates a competitive internal selection process for twenty candidates each year to participate in the highly sought after program. Over the years, many EXCEL graduates have been promoted into various levels of mid to upper-level management positions within the agency. Furthermore, throughout the years, we have contracted with various CVIOG management development associates to deliver specialized training to targeted audiences at various conference events. In addition, the CVIOG has partnered with GDOL to provide in-depth Financial Services training and certifications for our accountants and budget analysts. Our overall strategic alliance has proven to be a rich, results-oriented partnership. The CVIOG staff has consistently provided curriculums that are current and relevant to our training needs. Mr. David Key, the facilitator of our EXCEL Program, offers an exemplary skill set of perspective, creativity and application of learning. The [event] coordinators - Sharon Verbeek and Susan Maxwell - offer a high degree of flexibility, dependability and attention to detail and quality. We have been very pleased with the caliber and competencies of all CVIOG staff. The impact of the partnership has been beneficial in numerous ways. We have seen measurable results in terms of succession planning through internal promotions of EXCEL graduates, measurable results in the enhancement of leadership competencies and effectiveness through the EXCEL Academy leadership development and improvement projects, and measurable performance results in terms of knowledge, skills, and abilities of our Financial Services staff. Thank you for extending your expertise, resources and outreach to government organizations! I have participated in the [Institute of Government’s] Georgia Certified Economic Developer program and hope to earn my certification within the next year. I have incorporated many of the lessons into my practice, primarily my approach to regional cooperation with fellow economic developers in Northeast Georgia. I have also used the curriculum to create a community education program on the importance of having shovel-ready industrial sites, proper zoning for those sites, and pre-installed infrastructure. [GCED Program Manager] Jennifer Nelson and I have known one another since she was a project manager at the Georgia Department of Economic Development, and I have always admired her positive attitude and professional demeanor. Additionally, the guest lecturers at various classes of the Georgia Certified Economic Developer program have all given enlightening insights into their respective expertise. I was particularly impressed with [Institute faculty member] Marci Campbell and her lecture of professional communication when dealing with elected/appointed officials. With respect to the Georgia Certified Economic Developer program, I have used the lessons to inform my community leaders on the importance of having shovel-ready sites that are primed for development. As a result, the local Development Authority is active in planning the extension of infrastructure in its industrial park, as well as discussing the possibility of investing in a speculative industrial building. Additionally, I have put the Community Engagement lessons to use by creating a series called “Economic Development 101,” where project managers from the Georgia Department of Economic Development give their insights into recent industrial investment decisions and compare those trends with the community’s offerings. It is my hope that the Community Engagement program will enlighten the public to the need for active investment attraction programs and that the Development Authority will be the active agent in the development of industrial property that can be strategically marketed to prospects. The Georgia Certified Economic Developer Program is a wonderful initiative that will help our state reach new heights of excellence. I am very glad the Carl Vinson Institute of Government took the initiative to launch this program, and I look forward to earning my certification.